The AzureCAT patterns & practices team has published nine new design patterns on the Azure Architecture Center. These nine patterns are particularly useful when designing and implementing microservices. The increased interest in microservices within the industry was the motivation for documenting these patterns. The following diagram illustrates how these patterns could be used in a microservices architecture. For each pattern, we describe the problem, the solution, when to use the pattern, and implementation considerations. Ambassador can be used to offload common client connectivity tasks such as monitoring, logging, routing, and security (such as TLS) in a language agnostic way. 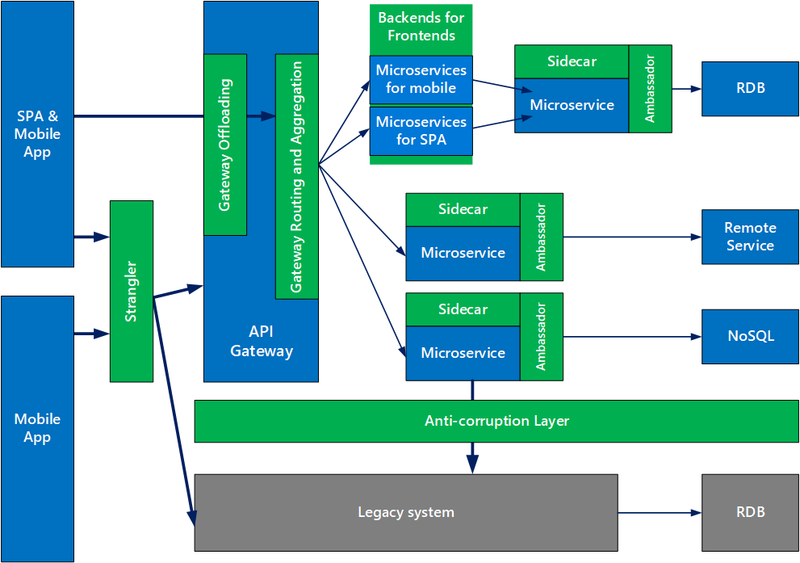 Anti-corruption layer implements a façade between new and legacy applications, to ensure that the design of a new application is not limited by dependencies on legacy systems. Backends for Frontends creates separate backend services for different types of clients, such as desktop and mobile. That way, a single backend service doesn’t need to handle the conflicting requirements of various client types. This pattern can help keep each microservice simple, by separating client-specific concerns. Bulkhead isolates critical resources, such as connection pool, memory, and CPU, for each workload or service. By using bulkheads, a single workload (or service) can’t consume all of the resources, starving others. This pattern increases the resiliency of the system by preventing cascading failures caused by one service. Gateway Aggregation aggregates requests to multiple individual microservices into a single request, reducing chattiness between consumers and services. Gateway Offloading enables each microservice to offload shared service functionality, such as the use of SSL certificates, to an API gateway. Gateway Routing routes requests to multiple microservices using a single endpoint, so that consumers don't need to manage many separate endpoints. Sidecar deploys helper components of an application as a separate container or process to provide isolation and encapsulation. Strangler supports incremental migration by gradually replacing specific pieces of functionality with new services. The goal of microservices is to increase the velocity of application releases, by decomposing the application into small autonomous services that can be deployed independently. A microservices architecture also brings some challenges, and these patterns can help mitigate these challenges. We hope you will find them useful in your own projects. As always, we greatly appreciate your feedback.